I love how bright tasting this is. I’ve made it with both orzo and quinoa and both are equally good. I was originally going to make this with tilapia but decided to get sole instead. This turned out to be a good thing. The sole is so thin, I decided to roll it up and that worked really well here. Although there is some preparation involved with the vegetables, overall the dish keeps the simplicity I was looking for. Get the oven going at 400°. Rinse and dry the sole. On a baking sheet with parchment paper if needed, brush the fish with olive oil and sprinkle with fresh cracked pepper and sea salt flakes; then roll the fish and repeat with olive oil, salt, and pepper. Place in the oven when everything else seven or so minutes from finishing. You can top the fish with some toasted panko at the end if you like some crunch. Actually, it’s your fish, so you can put whatever you want on it. I have a nut allergy so I can’t tell you if chopped nuts are a possibility here. Get a pot of water going for the orzo or prepare quinoa or couscous according to how you like to make it. Then work on the sauce so it can have a little time for the flavors to come together. In a food processor or with a mortar and pestle or on the cutting board: about two cups of parsley with lemon zest, lemon juice, olive oil, salt, and garlic— to the taste and quantity you want. I use the zest and juice of one lemon to be economical and as many a four cloves of garlic because I love garlic. I wonder if basil would work instead of the parsley; I think I’ll try that try that now that my basil plants are getting too big. I may also try adding some tarragon with the parsley. Then set to work on your vegetables. I like carrots, broccoli, and yellow squash. I cut the carrots and squash into thin half-moons and the broccoli into small half-crowns (you can save the stems for slaw). Then saute in a little olive oil, salt, adding a clove or two or four of crushed garlic at the end. I put the carrots in first for a minute or so, then the broccoli, and then the squash. You could also boil the vegetables in with the orzo by adding the carrots the last four minutes and the broccoli and squash for the last three to two depending on the thickness. I also want to try adding some red pepper; maybe taking out the carrots or the squash. If there’s still some asparagus around, that would be good here too. Lots of things could be really good here. Once the orzo is in and the vegetables are sauteing, the fish can have its turn. The fish is ready when an instant read thermometer says 145º or when a fork or knife can easily go through the thickest part. Do I need to say ‘drain the orzo’? Then it all comes together in a filling little bowl. I’m thinking next time I’ll give the finished bowls an extra splash of lemon and dash of sea salt flakes before it hits the table. Update September 2015: I also like Nuñez de Prado, another ‘spicy’ olive oil. I also made this with tilapia, but I wasn’t crazy about it. I’m sure there are other mild white fish that will work here, so I’ll keep an eye out. I also want to try couscous as the base. 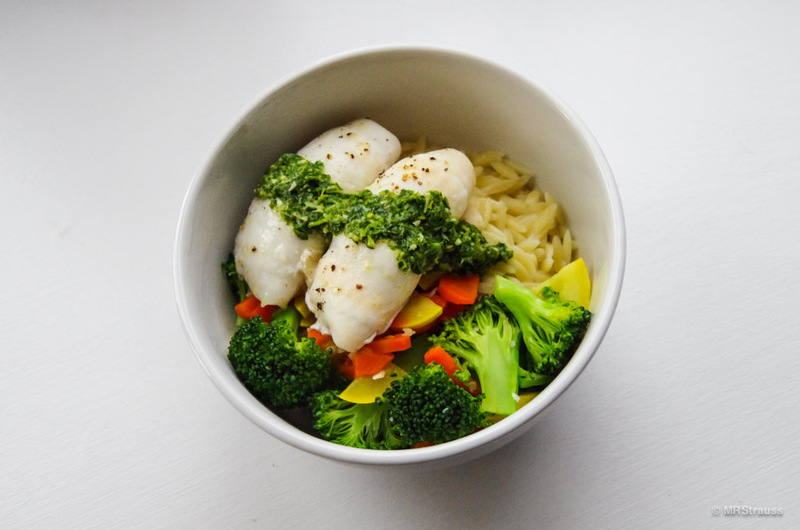 This entry was posted in Bentosh and tagged Bentosh, Orzo, Quinoa, Sole on June 30, 2014 by mrstrauss.